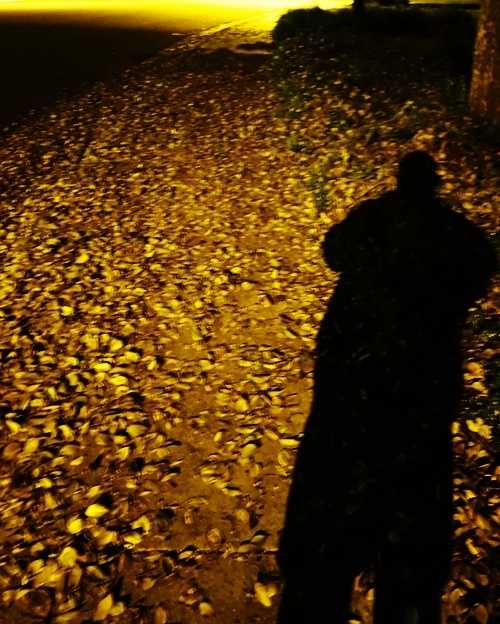 Tonight I will share a few pictures from my late evening walk. I did get my steps in today, but it was late since I fell asleep on the couch when I got home. In my post Back Home to Fall Color I mentioned that the sidewalks now are covered with leaves in some places. I decided to snap a picture of the leaves. I like my silhouette in this picture. You can see that I am bundled up a bit as the temperatures were in the low 40’s, or single digits if you are thinking in Celsius. Of course, I like the rustling of the leaves as I walk through them. This picture did not come out too good, but considering I just held my camera skyward and pressed the shutter it is not too bad either. 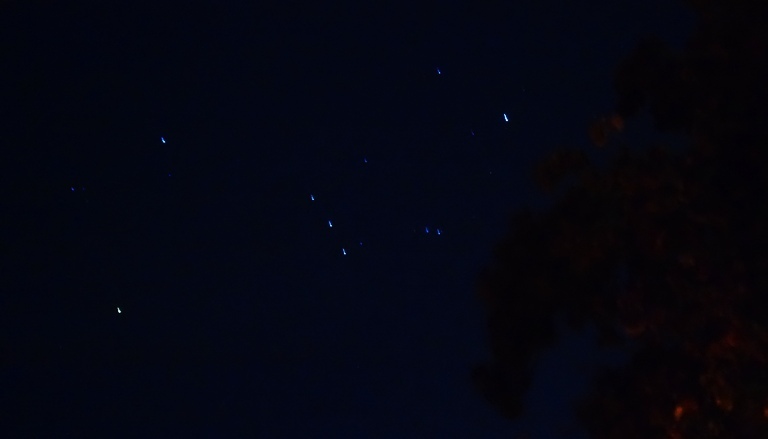 At this time of year Orion is tilted over on the side. However, you can make out most of the main stars of the constellation. Of course since it is December the Christmas lights are starting to appear. Here is just a simple star, but it is really pretty. 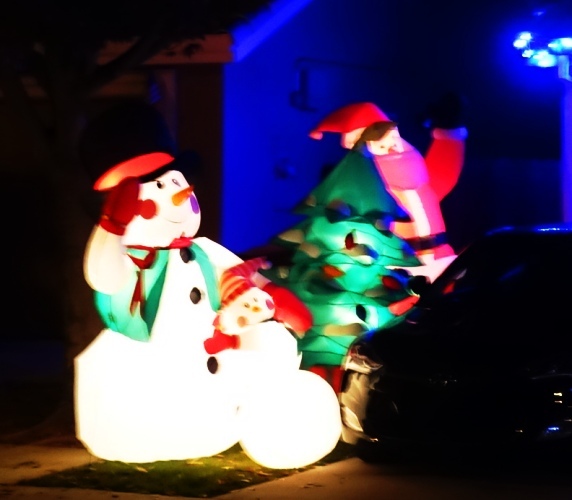 Here are some blow-up decorations. Here we have a large Santa, snowmen and a Christmas Tree. These alone would make for a cool display, but wait until you see the rest of the yard on the other side of the driveway. Are there enough decorations in this yard? Of course, when I drive to work in the morning it looks like there has been a massacre as they are all lying deflated on the ground. I hope that you enjoyed the images from my walk tonight. 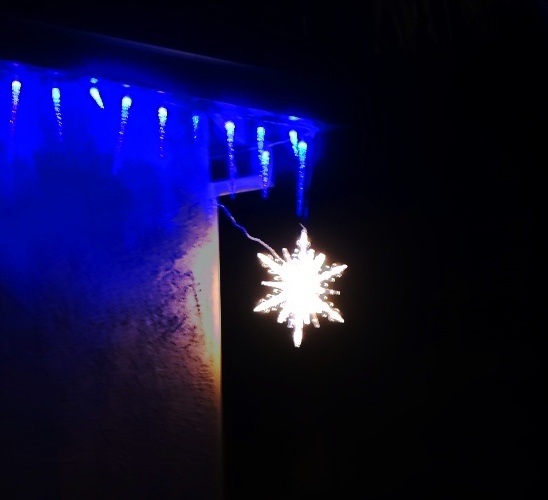 This entry was posted in California, Culture, Holidays and tagged blow-up decorations, Christmas Decorations, exercise, leaves, Night Sky, Orion, silhouette, Walk. Bookmark the permalink.